Ever wonder what it’s like to play an antique pump organ or to peek inside a pipe organ to see how it works? 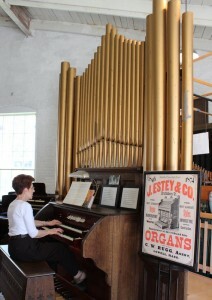 You can experience these and more at the Estey Organ Museum, where we celebrate the music and instruments produced by the Estey Organ Company, and highlight the contributions of the Estey Company and its employees to Southern Vermont. We invite you to bring your curiosity (and your favorite sheet music) and enjoy an afternoon at the museum. We’re located in the Old Engine House, part of the historic slate-sided Estey factory building, ten minutes off Interstate 91, Exit 1 North. Come visit us. Thank you to Gail Friedman, Phil Stimmel, and Ned Phoenix for photos used on this site.